Y’ever booked a hotel or a car rental with a credit card? Know how they don’t charge you until your stay, but they put a “hold” on your card for the room charge or drive time, effectively reducing your available credit? 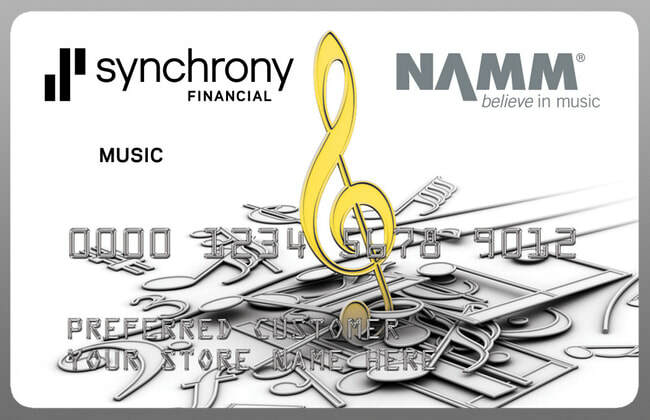 That’s one reason to get a Supersonic Music Store Card—keep your credit card available credit ready to use however you need, and still have time to pay for that new cymbal or amp. In a few easy steps, you can apply for a Store Card, administered by Synchrony Financial, which is valid for use at either of our Topeka or Lawrence store locations. To be able to apply, applicants must meet/complete these requirements: 1) Be an adult U.S. citizen, 2) fill out a short form*, 3) have some pre-established credit, 4) provide two forms of ID, preferably a driver's license and a valid credit/debit card. We submit this info over an encrypted line to Synchrony Financial who replies right away. Usually, submission and reply take 3-4 minutes. Occasionally we need to add a few minutes to clarify something by phone. Congratulations! When you’re approved, you get a unique account number which is available for use right away. You’ll receive a plastic card by mail, usually in about two weeks, which looks like a credit card. If you’re declined, you’ll get a notification of why as well the ability to get your credit history report; if there are errors on your credit report, you can protest which might improve your world! You can use your Store Card for purchases of any amount up to your available credit. Purchases can be for absolutely anything we would put on a receipt—products, service, etc. For any purchase you will get a bill from Synchrony Finance with payment information. Pay in full on time for no fees or interest. Make minimum monthly payments on time for no fees with interest. Use your statements to organize your music equipment expenses each year for taxes. For any purchase over $300.00, choose whether or not to get Special Financing terms. Take up to 6 months to pay for your purchase with no interest or fees if minimum monthly payments are received by Synchrony, on time, and the balance is retired in full on time. Extended terms may be available for purchases of higher amounts. Take up to three years to pay for your purchase with equal payments, including interest (specific minimum purchase amounts required). *Tips for a strong application: Fill out ALL questions including phone numbers. Include income from ALL persons (even if not related) at your address, not necessarily just yours. Use a co-signer who would share responsibility for purchases.